Description of "Letters of Helena Roerich I: 1929-1935"
Helena Roerich was an unusually gifted woman, author of many books. Her collected Letters, in two volumes, are an example of the wisdom, spiritual insight, and simple advice she shared with a multitude of correspondents—friends, foes, and co-workers alike. The Alpha and Omega of self-inquiry. by P.V.S.SURYANARAYANA RAJU. Nija Vicharana. by P.V.S.SURYANARAYANA RAJU. 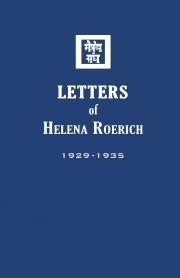 Reviews of "Letters of Helena Roerich I: 1929-1935"